What are the technologies lying under the hood of Google driverless car? We have been posting continuously about Google’s driverless car project. We mentioned about the use of RFID tags in Google’s driverless car and how it prevents its misuse. The car is loaded with lot of astounding features. It gets parked automatically, recharge its battery by itself, stops at traffic signals and do many of the other cool things. You may want to know that how the car does all these things. What the Google driverless car carries under the hood (or bonnet)? To find the answer, we analysed the patents of Google and in the next few posts, we will be sharing with you about what this car may contain that is going to make it interesting. Google’s driverless car is a robotic chauffeur. Alike other robots it also contains a computer under its hood, and sometimes multiple computers also. The autonomous car of Google has an Autonomous driving computer. It communicates with other devices installed in the vehicle like RADAR, SONAR, GPS, braking system, acceleration system. The robotic chauffeur gets information from these equipments and makes a control strategy to drive the car in autonomous mode. This is an interesting feature. The autonomous driving computer of driverless car can be stored at a remote place from the car, like at your home or at your office. The computer inside driverless car will continuously communicate with the autonomous computer. The autonomous computer will be at your home or at your office and you can control your car from there. It can be your phone as well. 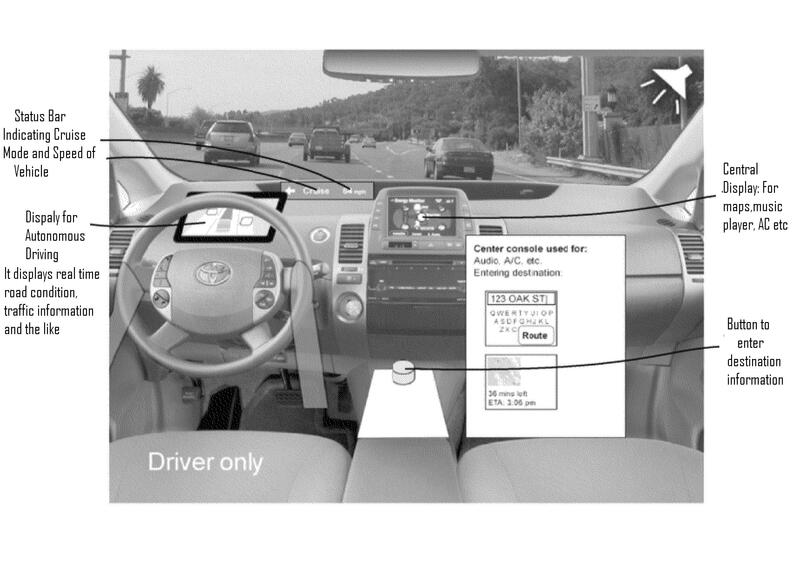 Two display screens will present inside the car to provide information to a passenger in a number of ways. One among them is present at the middle of the dashboard and another is present at right behind the steering. On the dashboard, a status bar will be present. It indicates the current status of autonomous computer. It displays “D” when a human is driving the car along with the speed. The status bar of driverless car displays “R” when the autonomous computer is ready to control the car. It displays “Cruise” when the autonomous computer drives the car i.e. car is in driverless mode. The display screen that will be present behind the steering displays real time road conditions and traffic information. The screen that will be present at the center of the dashboard displays music player, maps and other information. The display that is present at the center of dashboard is used to enter destination information on navigation system. When you will enter your destination, one or multiple routes to your destination will be generated on the screen. You will select one route among them; the car will start maneuvering toward your destination. Now to follow that entered route, GPS and Navigation system is installed in the self driving car of Google that is going to guide it during the drive. The car will also be having LASER, RADAR, Sonar and cameras installed in it to detect objects on the road. Google is going to use these equipments for navigation purposes as well. The Laser-based localization systems, inertial-aided GPS; camera-based localization is going to be used in addition to the conventional GPS. The next post will be talking about how Google finds obstacles on the roads and what actions it takes.